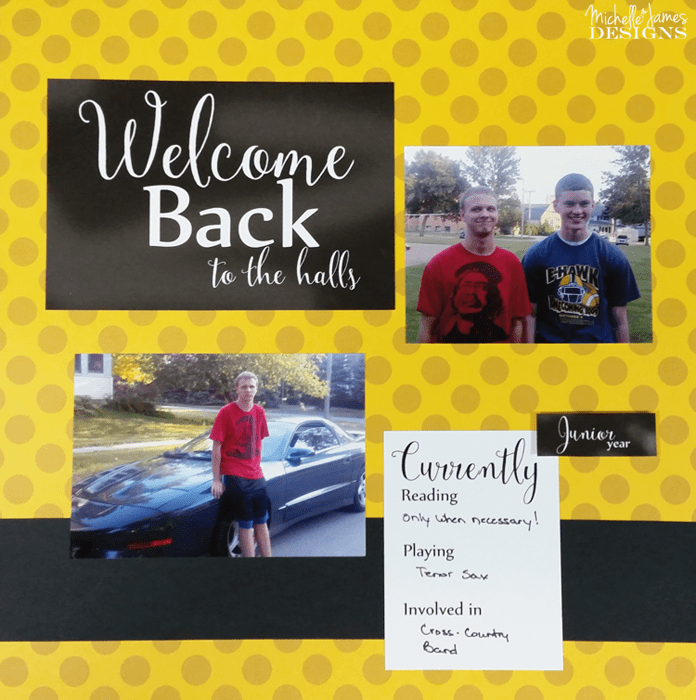 Start back to school in style with free printables for school pics! There are just a few more weeks before school starts. I cannot believe it. Brian was home for a month but we have already moved him into his new apartment in Iowa City. He has switched schools this year and will now be attending University of Iowa and studying Cinematography. Ian and Hailey are there, or close by, so I am happy that they are together. Every time Brian moves my friends and family are asking for his new address. This year I am fully prepared. 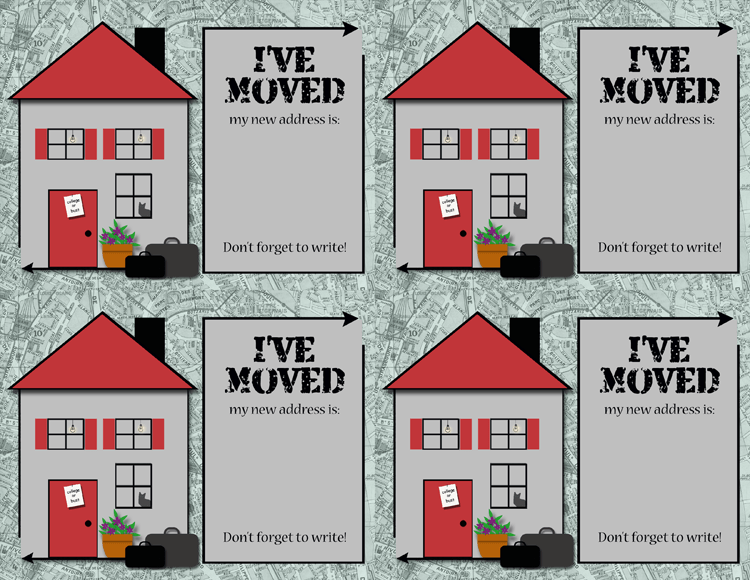 I have designed an “I’ve Moved” card on his behalf and will be sending it out shortly to all who may, or may not want his new address. LOL! Back to school happens every year and I think for parents it is bitter-sweet. Especially for parents of college students. Jeff and I love being empty nesters but Brian was a huge help this time he was home and it was definitely sad to see him go. I created this to ease the texts and emails that come in when he moves. My sister, my brother, his grandparents and the like are wanting his address and for good reason. So why not beat them to the punch this time? Right? If you are in the same boat feel free to download it too. I have provided links at the end of this post. After you get it downloaded follow these easy steps. Step 2: Using a paper trimmer cut in half down the middle – both ways. The final cards will be 5.5″ x 4.25″. Step 3: Fill in the new address and use the reverse side to address them to your friends and family. Don’t forget that the download link is at the bottom of this post. When I design this type of thing a lot of people ask me how I do it. I use Photoshop Elements. I have an older version but it still works great when my computer works. My old laptop was having some issues. It was an HP and that thing lasted a long time. And before I had it it was Ian’s. So it had be around the block a few times. That is what is so great about HP computers. They really do last a long time. It was time for me to start looking and I ended up getting this a new HP Envy 360. I LOVE this laptop. It is so cool because it does so many things. I can actually use it 4 different ways. 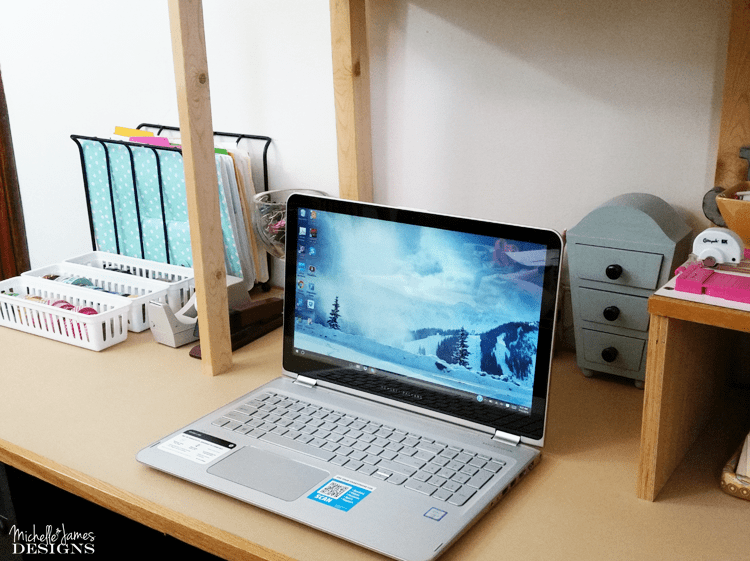 Like a regular laptop – as shown in the picture above. In “tent” mode – because it also is touchscreen. Woot Woot! I am not a gamer but I think this would be a great way to play. In “stand” mode. So I love this when I am watching a new blogging video, You Tube video or watching Netflix. And in tablet mode. This is one of my favorites when I am sitting on the couch in the morning with my coffee pinning away on Pinterest. The other thing that I love is the battery life. I can use it on the couch or at my desk for almost the entire day. On a Saturday/Sunday when I am running in and out between painting and blogging and designing, this is important. I don’t have to stop to plug it in. So far, I just plug it in at night and let it charge for the next day. When Brian was home he showed me the light up keyboard and how to brighten or tone down the screen brightness. Both of these are so handy in the evenings. Jeff likes to watch tv practically in the dark. Well, now I can actually see the keyboard plus I don’t hurt my eyes with the screen being too bright and he doesn’t have to have the light from the lamp glaring onto the tv screen. It is definitely a win win for us! When I watch a blogging video or a movie or show on Netflix the sound is awesome. 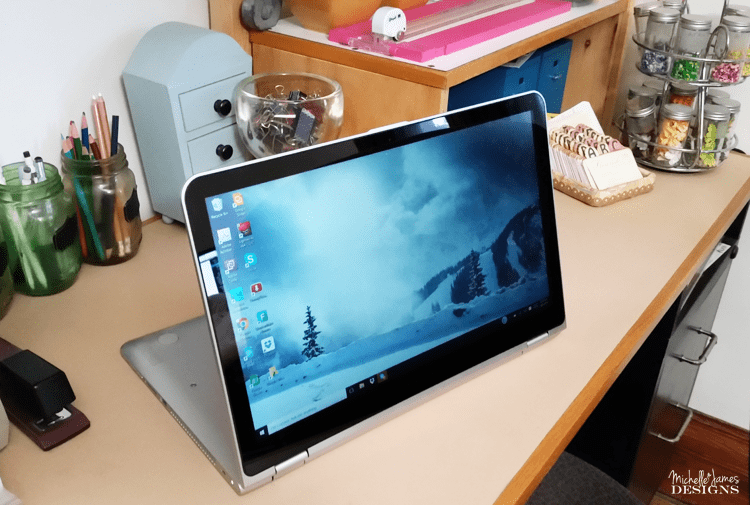 It has a state of the art Bang & Olufsen sound system which is also great for the Skype calls to my kids or my blogging peeps! The other thing that I love is the wide screen and the visuals. They are crisp and clean because of the IPS Full HD display. It is so nice for creating my scrapbook designs and making printables. The screen is a 15.6″ which is perfect for me. But I can really see this being a great computer for college students and families with kids in school as well. The technology in the schools now is crazy even since Brian graduated 2 years ago. Parents always feel like they need to keep up so their kids can do their homework and get it turned in online like the teachers and professors require. This laptop really fits the bill for families and students because it does the job and is affordable. We all love that! 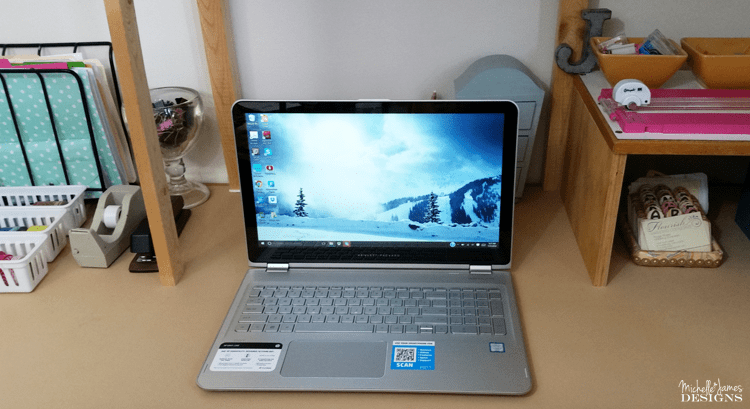 This HP Envy 360 is NEW at Walmart and can be found in the Laptop section. 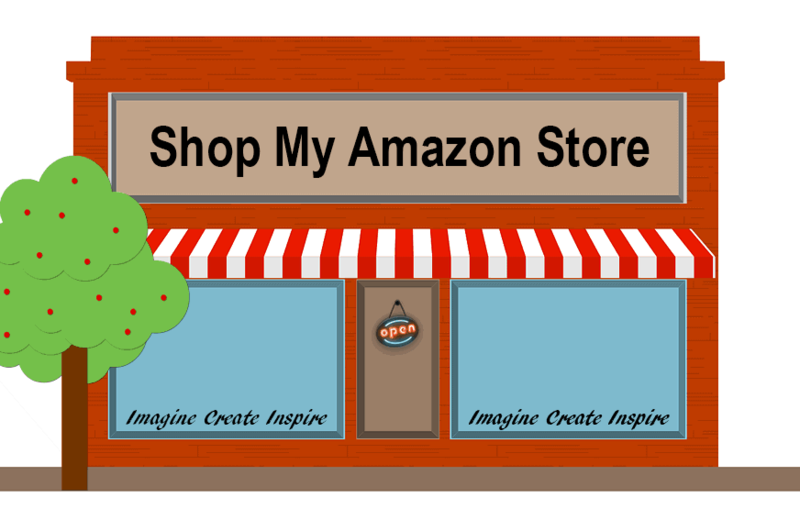 Sometimes the stores have different selections so be sure to call first or you can purchase online and have it shipped to the store. You can see more about this laptop or other HP computers and products at the HP website. Here is my desk looking pretty clean! LOL. It won’t stay that way for long. LOL! You guys know me better than that right? 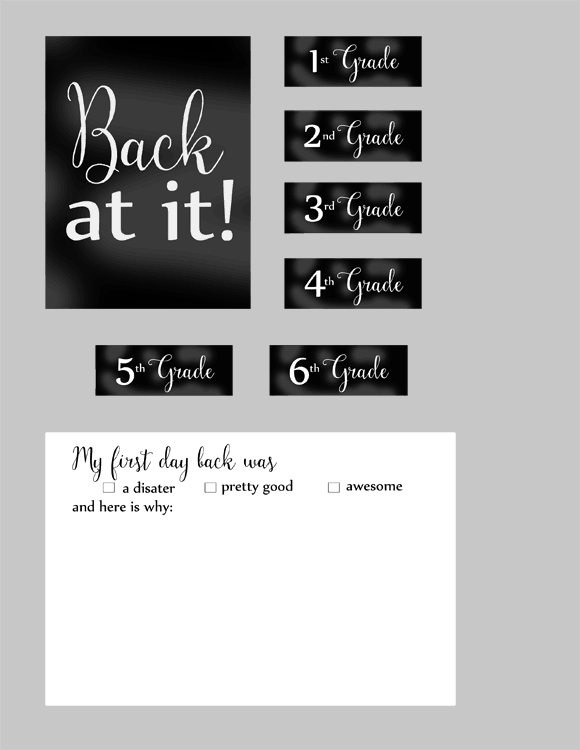 The “I’ve Moved” card is great for college kids but I wanted to create some thing for moms of school age kids as well. Last year I made this School Kit and I love it. Now except for the calendars this kit is still very usable. Go ahead and download it too! But I wanted to do something new this year. 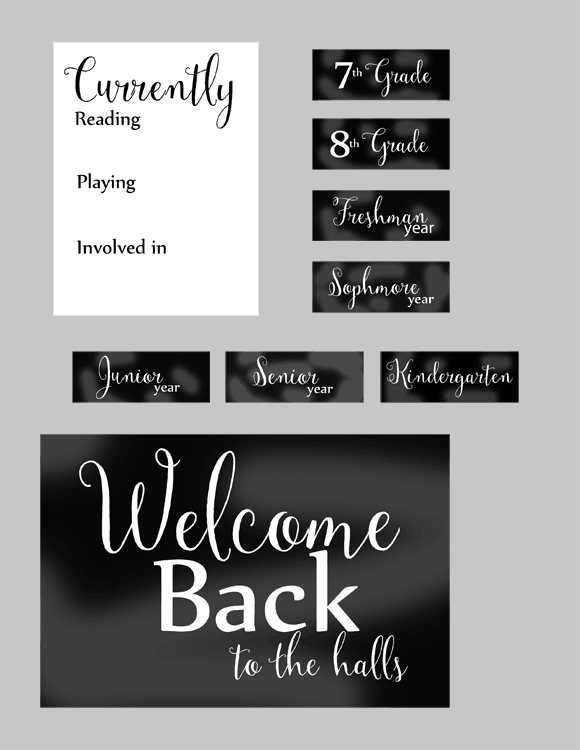 I love the chalkboard look so I designed a back to school kit with the chalkboard theme. The kit includes two 4×6 cards, two 3×4 cards, a frame-able 8.5 x 11 page, and thirteen grade tags to add as fun elements on your pages! 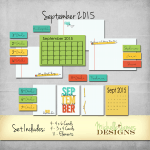 When you download this kit you get the individual elements but you also get the print pages. There are three of them. One is the frame shown above in the kit. The other two will look like this when printed. Step 1: Print onto white card stock. Step 2: Cut out the elements you need for your pages. You can also add other embellishments and papers to your pages but I like to keep everything very simple. Families are busy so keeping it simple and fast but so that it still looks good is important. Step 3: Add photos along with the cut out pieces to create easy pages. I created the page below for Brian’s junior year. 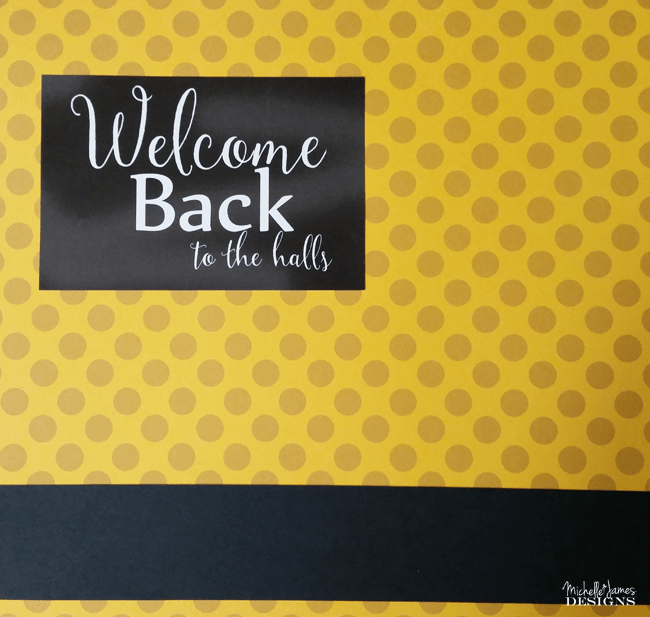 First I adhered the Welcome Back to the halls card and a strip of black card stock (2″ x 12″) to the gold polka dot background paper. Then I added in the pics. I cut out the “Currently” card and filled in the blanks. It is fun for kids, no matter what age, to look back and see their mom’s handwriting or their handwriting if you want them to complete the cards. I used the “Junior year” tag element and adhered it with some mounting tape so it would stick up just a bit. It is a fast & simple page that is ready for the scrapbook. If you are a digital scrapper. I have got you covered. Each of the elements are included as individual files so you can drop each one onto a page. 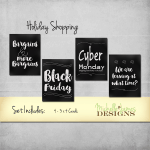 If you are a Project Life scrapper digital or traditional these cards fit into the digital templates from Becky Higgins or into the physical page protectors. No gluing involved. LOL! 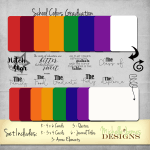 You could also use the elements to create a fun back to school card for your teacher/s. 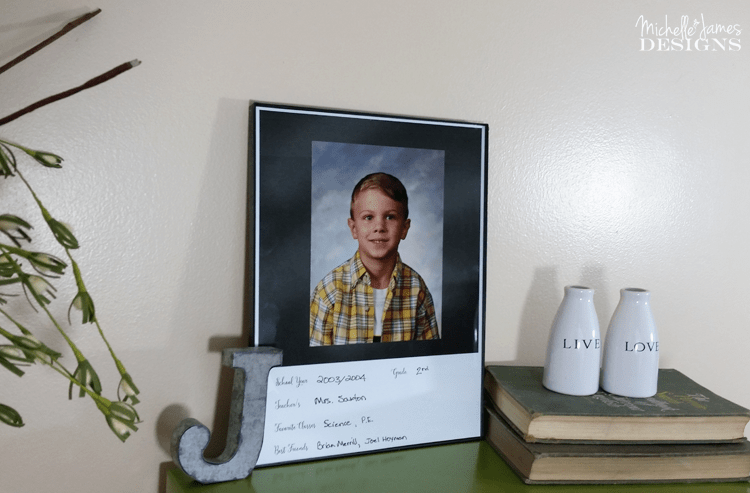 The frame page in this kit is designed for back to school pics or school pics. It also can fit in the 8.5″ x 11″ frame or you can trim it down a bit and use an 8″ x 10″ frame. Adhere your photo (mine is a 5″ x 7″) to the front of the page and insert into the frame. I hope you liked this post with all of the back to school images and HP computer information. If so, please pin it and check out the computers online! 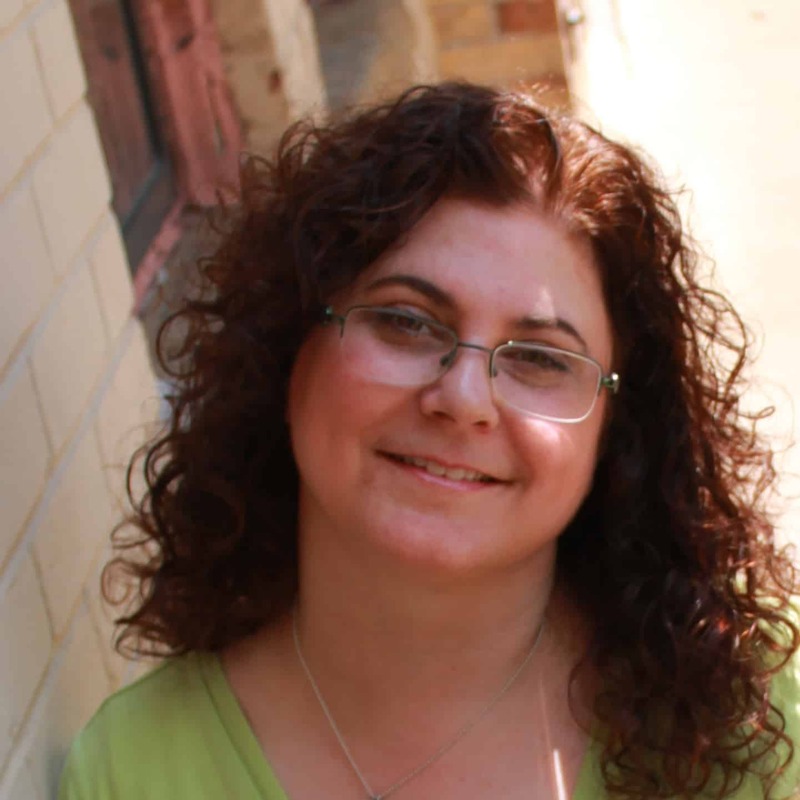 I was so excited to be working with Walmart and HP for this blog post. 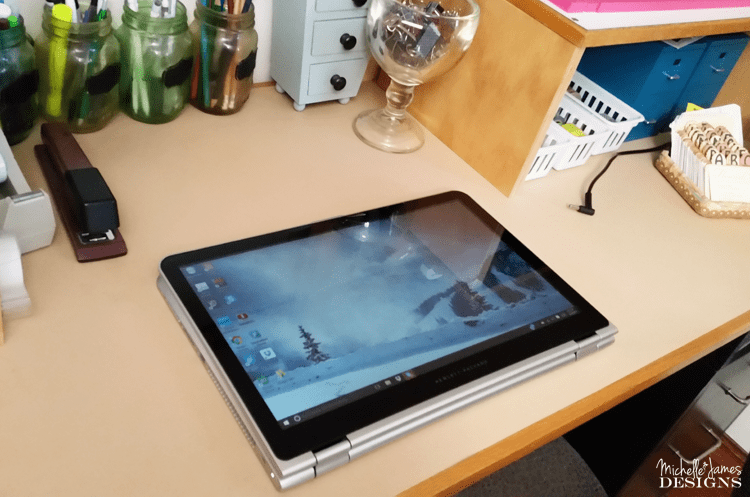 HP provided this Envy 360 for me to review which was so generous of them. 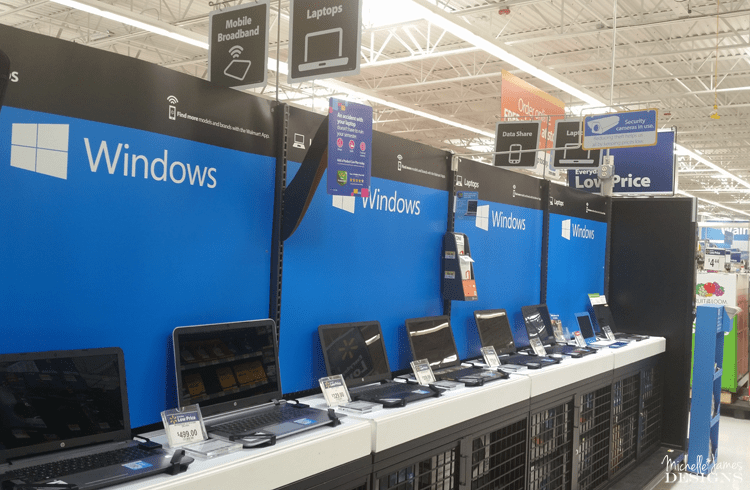 If you use your HP computer as much as I use mine and you love it like I do, share your thoughts with an online review at Walmart. I know I like to read reviews when purchasing products so it helps and encourages others with their back to school decisions. Be sure to check out all of the HP computers. You can find them at create with HP. Here are your download links as promised. Enjoy. 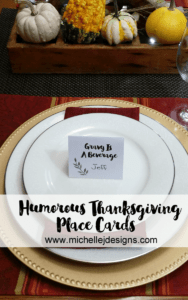 Love the printables Michelle! Perfect for both kids in school, and those that have moved on to college. 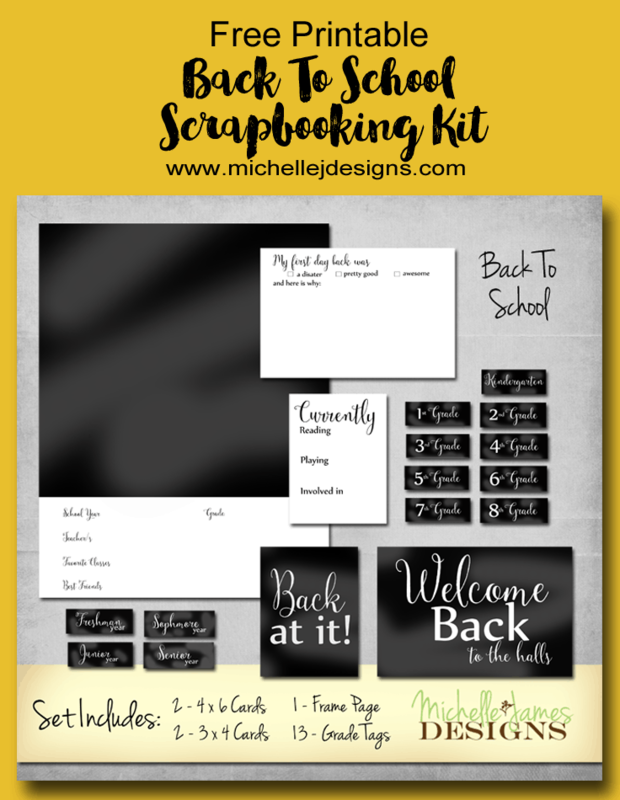 I still have a few years before the nest is empty, so the back to school printables will be perfect for this year for us. That laptop is fabulous! Love the versatility of it, being able to use it so many different ways. Great find! Thank you Heather. I hope you get some use out of the printables. I am loving this laptop. I have never had one that flipped over and stood in different “modes” so it is a real treat! Congrats on the laptop Michelle. It’s awesome. Love the labels too! Thank you Carolann. I do love this laptop! O.M.G love the I’ve Moved Cards and Back to School too Michelle. I do admire your work immensely and want to hire you to do some printables for my blog for freebies. Hi Sue! That would be a fun project. You just let me know what you want. Thanks for the compliment it means the world to me! This is an amazing post. You make the cutest cards. Hope you don’t mind if I pin and share it all around…. LOL… Congrats Michelle!! Thanks so much for all of the love Qs! I don’t mind a bit. LOL! I appreciate it very much. What a great post Michelle! 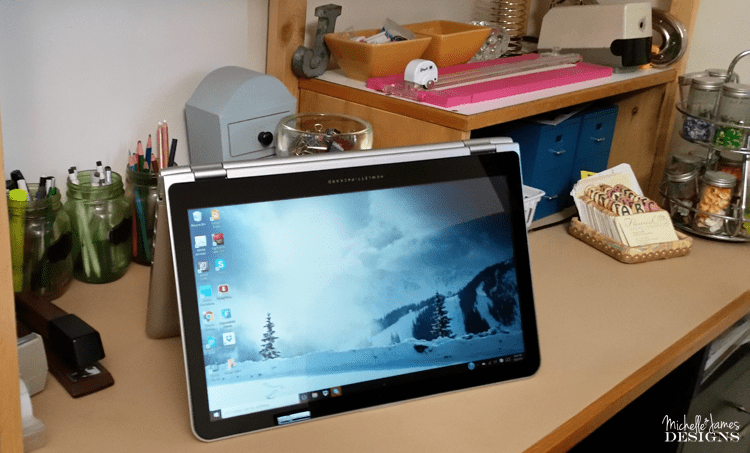 The HP Envy looks amazing! I love how you can stand it & that it has a lighted keyboard! I printed out your awesome I’ve Moved cards to use for my daughter! I’m pretending to be organized ???? Your digital designs really inspire me! Hi Michelle! I am glad you could use them. I need to get mine addressed and sent out. I am pretending to be organized as well. LOL! Thanks for stopping by! Hi Michelle! 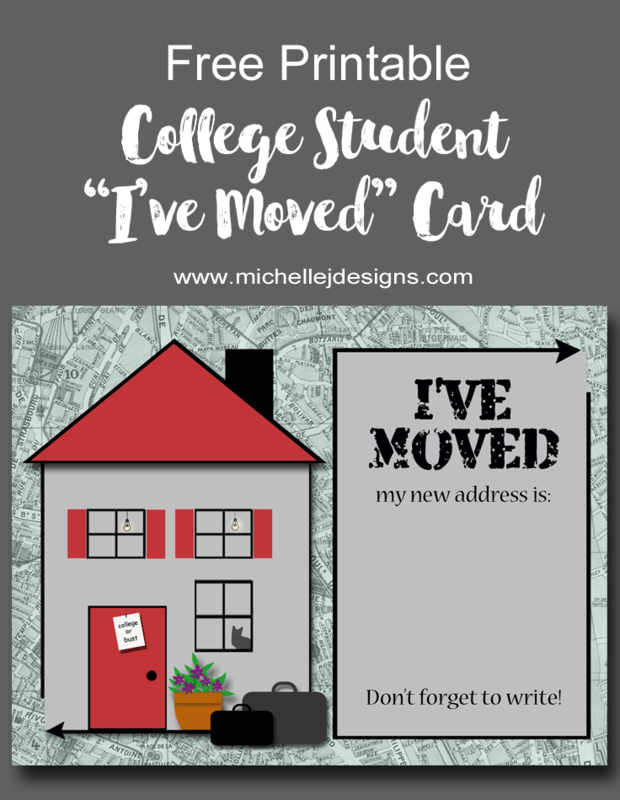 Just found her free moving college kid moving card printable today. What perfect timing!!!!! I’m in a hotel room in Ames ( I live in Sioux City) after moving my college kid to his new apartment! He’s been going to ISU for 4 years now…. He dropped to part time and should graduate in the next year or two. I also have an HP envy 360! I love it too! I guess I’m an HP girl too. My old HP computer is still chugging along too… Thank you so much for sharing your cute printable!!!! Again, the timing is so perfect!